Throughout the month of February Jews around the country have been observing Special Needs Awareness month. The Dallas area is no exception. The Special Needs Partnership of JFS has led a number of different activities throughout the month for children, families, teens and educators. It all will culminate this weekend with a special Shabbat experience featuring Rabbi Shimshon Jacob, Talmud instructor at Rae Kushner Yeshiva High School in Livingston, N.J. Families are invited to attend any or all of these free events. On Saturday Feb. 25. at 9 a.m. Shabbat services, Congregation Shaare Tefilla, 6131 Churchill Way, Dallas 75230 will host Rabbi Jacob. Childcare is provided, but an RSVP is required. At 9:45 a.m. there will be an inclusive family service for beginners. Then, at 11 a.m., Rabbi Jacob will speak on “Inclusion in the Jewish Community.” There will be an inclusive activity for kids provided by Dallas Yachad. Kiddush at 11:45 a.m. will be hosted Malka and Rabbi Maury Grebenau in honor of the recent birth of their daughter, Talia Ta’ir. A Taste of the World is catering. For Saturday lunch and afternoon, Congregation Ohr Hatorah and Torah Day School will host a community luncheon and fun activities for kids at 12:30 p.m. Please RSVP if you plan to attend. Ohr Hatorah (6324 Churchill Way) is located across the street from Shaare Tefilla, an easy walk after morning services. At 5 p.m., Rabbi Jacob will speak on “Jewish Education for All Children,” at Ohr Hatorah. Maariv/Havdallah Services will be held at 7 p.m. at Ohr Hatorah. The weekend will round out at 8:30 p.m. at DATA of Plano with a fireside chat and desserts with Rabbi Jacob. This talk “Inclusive ‘Special’ Education: One Man’s Experience” is for adults only. DATA of Plano, is located at 3251 Independence Parkway, Plano, 75075 It is the strip mall at the Southwest corner of Parker and Independence behind Half Price Books. For more information visit website: http://www.jfsdallas.org/special-needs-partnership. The synagogues hosting the Shabbat experience have extended the invitation to join them for any or all of Shabbat. In addition to the Shabbaton weekend, Rabbi Jacob will visit with ATID students at Levine Academy on Sunday morning. Next week, March 4 another special program will be held at Shearith Israel, 6101 Douglas Ave., at 9:15 a.m. It will begin with the training program for the teens: “Inclusion: I’m In, Are You?” and followed by inclusive activities: D’var Torah, Purim BINGO, face painting, make your own mask, games and create your own shalach manot hamantacshen. Incidentally, “The Inclusion Experience: Taking A Walk In Different Shoes” is available upon request at schools and organizations. Contact Teri Kachur at tkachur@JFSdallas.org or 972-437-9950 to schedule an “Inclusive Experience” for your class or organization. It is an interactive, multi-sensory curriculum designed to simulate the effects of specific disabilities, to help build awareness and to create an environment of empathy and inclusion for students and adults. A companion presentation includes posters of notable individuals who have adapted and overcome the affects of their disabilities to be recognized for their achievements. Target disabilities include: Developmental disabilities: including Autism, Asperger’s Syndrome, Down Syndrome and other intellectual developmental disabilities; dyslexia; ADHD; physical disability: fine motor; physical disability: gross motor; speech and hearing. One of America’s leading thinkers on immigration policy, Dr. Stephen Steinlight, will discuss “What’s at Stake in the Immigration Debate for All Americans and American Jews?” on Tuesday, Feb. 28 at 7 p.m. at the Museum of Biblical Art, 7500 Park Lane in Dallas. Steinlight has written extensively and spoken widely on this topic across the nation. He has shared the podium with presidential candidates, members of Congress, governors, leading public intellectuals and grassroots activists. He has also provided expert testimony to the Judiciary Committees of the U.S. House and Senate. The program is sponsored by Bnai Zion. A $5 minimum donation is suggested. For more information and reservations please contact Avrille Harris-Cohen at 972-918-9200 or avrille.harris-cohen@bnaizion.org. Join the Tycher Library for its Spring Read Sunday, Feb. 26 at 11 a.m. to hear Austin Ratner speak about his new book “The Jump Artist.” The event will be held at the Tycher Library housed inside the JCC, 7900 Northaven Road. Based on a true story, Ratner recounts the life of Philippe Hallsman, world-renowned photographer, and his time spent in prison for allegedly killing his father on a hiking trip in the Alps. This gripping tale of murder, love, anti-Semitism and guilt is sure to keep you on the edge of your seat. This event is free and open to the public. To read a book review by Harriet Gross and some quotes from the author, visit http://www.tycherlibrary.org/resources/book-reviews?id=8. 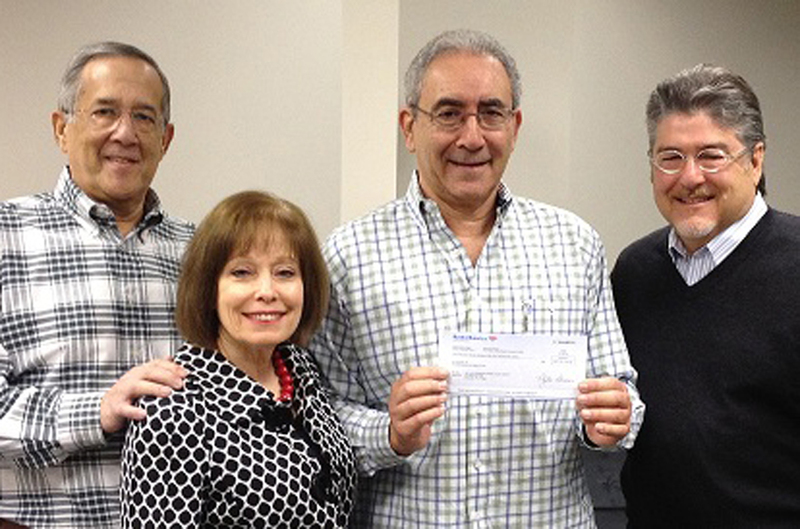 Dallas Hebrew Free Loan Association was awarded a grant from the Sylvan T. Baer Fund, administered by the Dallas Jewish Community Foundation. Stuart Prescott from the Dallas Jewish Community Foundation presented DHFLA treasurer Ivan Edelman with the check at the Feb. 12 board of directors meeting. The Sylvan T. Baer Foundation was established in 1965 in memory of Mr. Baer’s parents, Helen and Jacob Baer, to assist needy and deserving Jews. According to the instructions left in Mr. Baer’s will, an endowment fund was created to award up to $100 each year to Jews in need of financial aid. The board of directors of the DHFLA gratefully acknowledge the support of the Sylvan T. Baer Fund and the Dallas Jewish Community Foundation in furthering its mission to assist people of the Greater Dallas Jewish Community who are in need by providing interest free loans. TJP movie reviewer Susan Kandell Wilkofsky shared with us that this week National Theatre Live will present the best of British theater with a performance that is filmed live in high definition and broadcast via satellite to over 700 cinemas around the world. And the best part is … Dallas, Plano and Fort Worth will host screenings. Award winning actor Antony Sher leads the cast in “Travelling Light,” a new play by Nicholas Wright, directed by Nicholas Whitener and filmed live at the National’s Lyttelton Theatre. “Travelling Light” is a funny and fascinating tribute to the Eastern European immigrants who became major players in Hollywood’s golden age. In a remote village in Eastern Europe, around 1900, the young Motl Mendl is entranced by the flickering silent images on his father’s cinematograph. Bankrolled by Jacob, the ebullient local timber merchant, and inspired by Anna, the girl sent to help him make moving pictures of their village, he stumbles on a revolutionary way of story-telling. Forty years on, Motl — now a famed American film director — looks back on his early life and confronts the cost of fulfilling his dreams. The broadcast features behind–the–scenes footage and interviews with artists, in addition to the full performance. Tickets are $20, available in advance at the box office and online. The running time is approximately 3 hours including one 20 minute intermission. You can catch the performance at the Angelika Dallas on Feb. 25 at 2 p.m. or the Angelika Plano on Feb. 26 at 2 p.m.
J Camp Registration is now open! Camp Fair Day is on Sunday, March 4 from noon-3 p.m. There will be lots of great activities including a “J Naturescape Pass” for families to visit the new playspaces after you register. Camp Fair Day is the last day for the early bird fees — don’t lose your spot at camp — plus get 2011 prices! To get more details, contact Laura Seymour, Director of Camping Services, at lseymour@jccdallas.org. Mazel tov to Ivonne and Isaac Dickter who recently celebrated their 50th anniversary on Jan. 27. To celebrate the milestone the Dickters traveled to Israel. The Dickters are blessed with daughter Ruth and son Reuben and his wife Sandra. They kvell over their three grandaughters, Liora, Ronit and Talia. We would love to hear from our readers! Send your simchas, awards, honors and news to me by email at sharonw@texasjewishpost.com, or by snail mail at 7920 Beltline Rd., Ste. 680, Dallas, TX 75254 or you can fax to 214-466-2633. We are still looking for Good Sports to include in that special column.